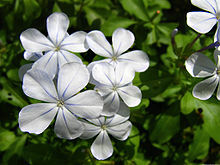 ↑ "Plumbago L." Germplasm Resources Information Network. United States Department of Agriculture. 2002-01-02. สืบค้นเมื่อ 2010-01-29. ↑ Quattrocchi, Umberto (2000). CRC World Dictionary of Plant Names. 3 M-Q. CRC Press. p. 2117. ISBN 978-0-8493-2677-6. ↑ Austin, Daniel F. (2004). Florida Ethnobotany. CRC Press. pp. 527–528. ISBN 978-0-8493-2332-4. ↑ Schmelzer, G.H. ; A. Gurib-Fakim (2008). Medicinal Plants. Plant Resources of Tropical Africa. p. 427. ISBN 978-90-5782-204-9. ↑ Burke, Don (2005). The Complete Burke's Backyard: the Ultimate Book of Fact Sheets. Murdoch Books. p. 268. ISBN 978-1-74045-739-2. 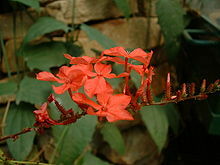 ↑ "Plumbago zeylanica L." Germplasm Resources Information Network. United States Department of Agriculture. 1996-03-19. สืบค้นเมื่อ 2010-01-29. ↑ "Species Records of Plumbago". Germplasm Resources Information Network. United States Department of Agriculture. สืบค้นเมื่อ 2010-01-29. หน้านี้แก้ไขล่าสุดเมื่อวันที่ 19 กุมภาพันธ์ 2559 เวลา 09:13 น.